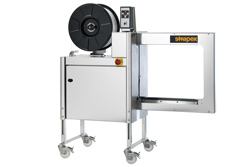 Strapex serves the market with strapping and stretch wrapping system solutions and services for securing goods for various industries. Locate your nearest Strapex partner on the worldmap below or send us your message by contact form. Sorry, currently is no Flash Player installed on your Computer, this website requires Flash 8 or above.